Cervantes' inspiring ode to the human spirit graces this layered pendant. In the course of his quest to vanquish windmills and champion his beloved Dulcinea, the man of La Mancha inspired us to "dream the impossible dream." His creator, Miguel de Cervantes, had a similarly poetic view of the power of the human spirit, saying "believe there are no limits but the sky." 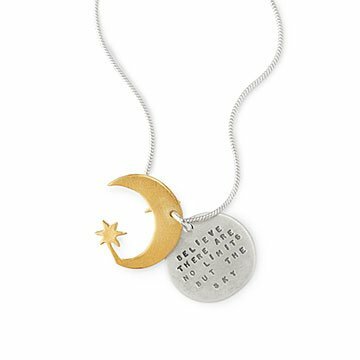 Kathy Bransfield's necklace honors the Spanish author's inspiration by featuring this quote on a sterling silver pendant with a celestial, 22k plated brass overlay. Suspended from an 18-inch chain, Kathy's design makes a thoughtful gift for sky's-the-limit grads and glass-ceiling crushers. Handmade in California.